Home/panel extenders/Does Your Office Need Panel Extenders? 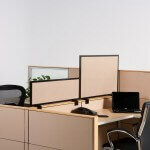 Does Your Office Need Panel Extenders? In case you’ve been looking at your current office space and trying to decide about your newest layout, panel extenders may be on your list of options. Will they work for your space? Let’s look at a few kinds of offices and how the work station walls affect productivity. For many offices, the work process has become much more collaborative which has translated into more low-wall cubicles and even benching systems in the workplace. Many industry experts believe the taller wall cubicles or “Dilbert cubes” are on their way out. However, low walls or no walls isn’t feasible for all workers. Benching systems are popular in Europe; the absence of panels allows you to cram more people into one area, which can foster creativity and collaboration but be bad for employee comfort and productivity in some cases. Cubicles with low walls (42″ high) allow employees to see and talk to each other while seated or standing, allowing for a lot of collaboration, team work and creativity. However, they still don’t give workers privacy (although workers do have a more clearly defined “owned” space) and acoustically offer no help at all. Medium height cubicle walls (53″ high) is the fall back option for many offices. Employees have more privacy and can be more productive. All they have to do to reach out to a co-worker is stand up. here is still not very much acoustical privacy, however. This brings us back to high walls, with panels 65” tall and greater. This offers the most acoustical and visual privacy. This is ideal for some workers and jobs that require some privacy, and extreme focus, but is no longer considered ideal. They can make many employees feel isolated and cut off. A blended solution is usually the best option. Panel extenders can help you customize each cubicle or group of cubicles to provide just the right amount of privacy while still fostering teamwork and collaborative creativity. You can even create pods of sorts, with each team having higher walls around the perimeter of their section to provide them with a sense of privacy, and lower walls between team members for ease of communication. Panel extenders can be the answer to your new work layout. Call us and ask for advice!